Written in Persian in the eleventh century, Omar Khayyam’s quatrains, known as rubai, were written individually for an audience at court, and explored the meanings of life, love, and friendship. They were almost completely unknown in the West until Edward FitzGerald–himself a relatively obscure critic–translated and organized some one hundred of them into a unified whole that he called The Rubaiyat of Omar Khayyam, which he published anonymously in 1859. Ignored initially, it soon became a sensation–and FitzGerald with it, his work now translated into seventy languages–and one of the most-read works of literature of all time. 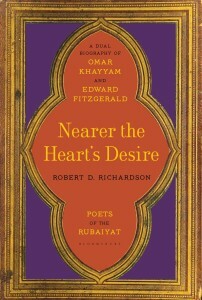 Deftly and eloquently recounting in turn the life stories of Khayyam and FitzGerald, linking them over the span of eight centuries, acclaimed biographer Robert Richardson has crafted the story of the legendary Rubaiyat itself, illuminating a literary classic and reinforcing its place in the canon of great world literature.